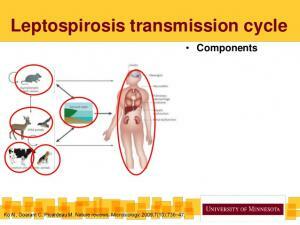 Leptospirosis can be carried by many different types of animal. The serovar starts by affecting the primary host out in the environment. This serovar can live in the primary host for long periods of time as they are the ideal living environment. The most common carriers of Lepto are rats, mice, raccoons, skunks and dogs. Humans, dogs, pigs and cats are what we call incidental hosts. This means that they must contract the disease from a primary host either by eating them or coming in contact with infected urine. 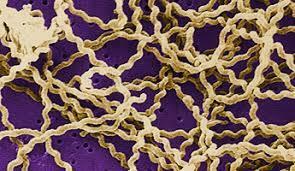 The infected animal sheds the spirochetes which is the infectious organism typically in their urine. Within the first week of contracting the disease it can be found in the blood and after 10 days of being infected without treatment, the bacteria will then begin to be found in the urine leading to more widespread contamination/infection. The urine can get washed into standing water sources by rain and then when other animals drink from these sources, they become infected as well. Most pets are what we call "subclinical" which means they will show no symptoms at all but can still be spreading the disease. The clinical signs are usually non-specific. They include vomiting, diarrhea, anorexia or lethargy which can be symptoms for a lot of other conditions too. Severe clinical signs include fever, pale gums, drinking more, urinating more, not eating or weight loss. Because these symptoms are so broad, veterinarians rely on clinical history to tell them more. They look to see what pets have been exposed to, where they have been recently, what their lifestyle is like and if they have been vaccinated against Lepto. These questions will help us decide if Lepto is a possibly and if testing should be done. My pet has been diagnosed with Lepto, now what? Sadly, accurate testing takes time to get results so if your pet is symptomatic and Lepto is even suspected it is time to spring into action! 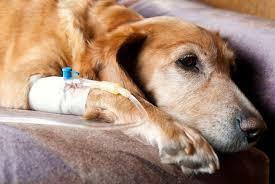 If the dog is experiencing kidney issues, they are typically hospitalized for rehydration and support. Medications are given to stop vomiting/diarrhea and they are given nutritional support and medications to help with eating. Because the disease is what we call zoonotic or can be transmissed to humans, special precautions are taken to protect veterinary workers. These animals are typically housed in an isolation unit to keep them away from other patients. The urine is very infectious until treatment is started so a urinary catheter is often placed to keep the contaminated urine contained or they will be given a special area of the yard to urinate and it is immediately sprayed with disinfectant. Thankfully, Lepto does not like hot weather or disinfectants so it is easily killed outside the body. Doxycycline is the antibiotic most effective against Lepto so the patient will be started on this antibiotic to kill the bacteria. Once test results confirm the diagnosis, it is important to have the other animals in the house tested even they are not showing symptoms since they typically won't and to talk to your doctor about their concerns. How can Lepto be preventative? Vaccinate!!! Prevention is the most effective medicine out there. Here at Westarbor Animal Hospital, we recommend the Leptospirosis vaccine as part of the core vaccinations for dogs. There is no vaccination for cats as it is a rare disease in them. Every dog, no matter what breed should have the vaccine to protect them. Your veterinarian can discuss with you any concerns you may have about vaccinating your pet. The vaccine protects against the 4 most common serovars of Leptospirosis so it is important to be aware there are other strains it cannot protect against. Other ways would be to make sure your pet is protected against the remaining strains is to always make sure they are drinking from a fresh water source you provide. Avoid letting them drink from ponds, puddles and other still water as they could potentially be sources of infection. Lepto is a disease that not only affects our pets but can affect us too! It can be very serious and even deadly in both pets and people so it is important to protect everyone! 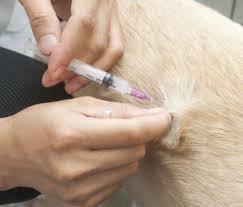 Vaccinate your dog which helps protect you and them. Please contact Westarbor today to discuss how we can protect your dog against this deadly disease!